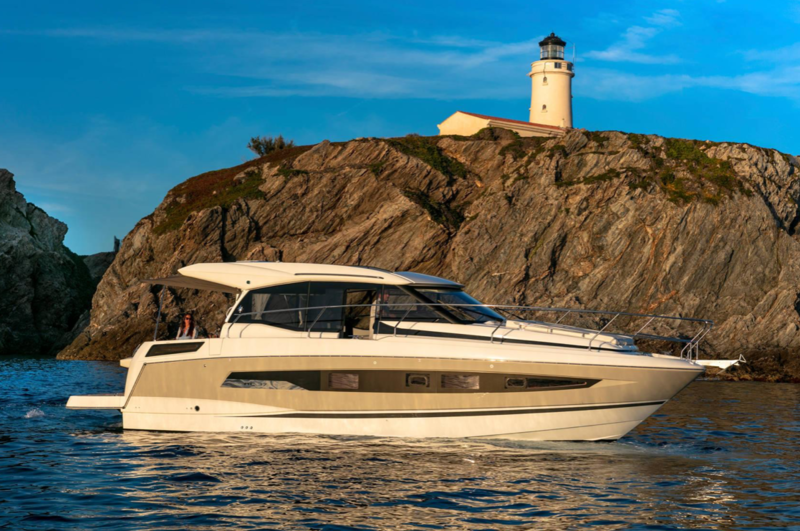 The new Jeanneau NC 37, a one-level family cruiser with a hull designed by Michael Peters, will make its North American debut at the Miami International Boat Show starting Feb. 14. 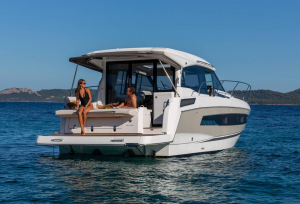 With its panoramic side windows, large sunroof and fully opening glass door aft, the new Jeanneau is a light-filled, French-styled coastal cruising boat that makes living on board easy underway or at anchor. You can step aboard from a large teak swim platform and enter the cockpit via a stainless steel gate on the starboard side of the transom. The cockpit is built for lounging, with a large L-shaped settee across the transom and up the port side; this entire area can be converted into a sundeck lounge. A bar is forward on the starboard side. Wide, recessed side decks lead forward. A sliding glass door opens from the cockpit to the salon. A nice touch is the window over the bar, which can be lifted up to open the entire aft section of the salon to the cockpit, blending the inside and outside of the boat. A large L-shaped settee is on the port side of the salon; the galley is to starboard. A bench seat is at the helm; a door there opens to the starboard side deck. There’s a sunpad on the bow; it can be outfitted with a canopy for protection from the sun. 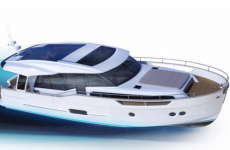 Below, the NC 37 can be ordered in a two- or three-cabin arrangement. 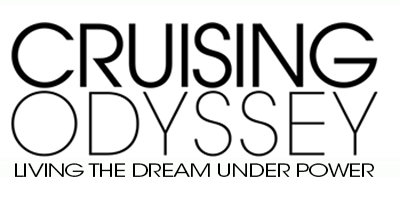 Either way, the master stateroom is forward, with a double bed, standing headroom and two overhead hatches for light and ventilation. The head arrangement is unusual, with the toilet on the port side, the shower to starboard. The guest cabin is aft a bit to port, with two single berths and standing headroom. On the starboard side, the third cabin has a double berth; in the two-cabin configuration, it is used for storage. The new Jeanneau can be powered by twin 200-hp Volvo diesels, or twin 260-hp Volvo diesels. Specs. : LOA: 37’7”; Beam: 13’5”; Draft: 3’1”; Disp. : 15,062 lbs. ; Fuel: 172 gals. ; Water: 79 gals. 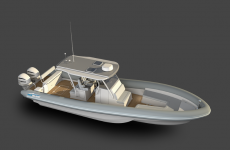 ; Power: 2×200-hp Volvo Penta D3 diesels; 2×260-hp Volvo Penta D4 diesels.